Have You Ever Thought About Growing Mushrooms? There's nothing like wanderg through the woods and finding those delicate red and white caps hiding in the qiuet corners of the dead trees. Believe it or not there are kits and tips on ways to grow mushrooms. You can grow them in your home or in your garden. You can eat them or just enjoy. Mushrooms have even been used in recent times to alleviate world hunger. 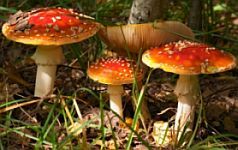 Having a rain garden in you yard or wet meadow on you property might create the ideal situation in which you could endevour in the art of mycology. In parts of the united states your rain gardens will be wet a good portion of the year and thick with wildflowers and other vegetation perfect for rain gardens. Underneath it all, it will be damp and dark, perfect conditions for mushrooms. Encourage their growth by adding rotting logs to the landscape. Mushrooms Do A Healthy Habitat Make. Mushrooms can provide yet another great source of food for native wildlife, including native slugs, such as the banana slug , which will not harm your other plants, but can be interesting to observe. Mushrooms, which are just the top, reproducing part of what can be a very large entity living throughout a forested area or in this case, your garden, can be essential to healthy ecology. You see fungi break down rotting material, creating excelent, organic compost. And that is just one example of what fungi do for us, right below or feet. Fungi do much more for the ecology of an area. If you don't want to wait and hope for mushroom growth try buying a mushroom growing kit from merchants like Gardening Express.